The state park boat floated in absolute silence on the small lake. Not a single bird chirped in the surrounding thick autumn forest; no fish splashed and broke the perfect, colorful reflection on the water beneath. Absolutely nothing stirred. I strained to hear any sound, but only stillness pushed back against my ears. This would be a decent place to spend my last day alive if the world was ending and the circumstances didn’t allow for my optimal method of passing. (If given the choice, I’d prefer to be killed in a volcanic eruption.) Note to self. This moment of eerie Zen took place on Teddy Lake, located in the most remote state park in Michigan—Craig Lake State Park. 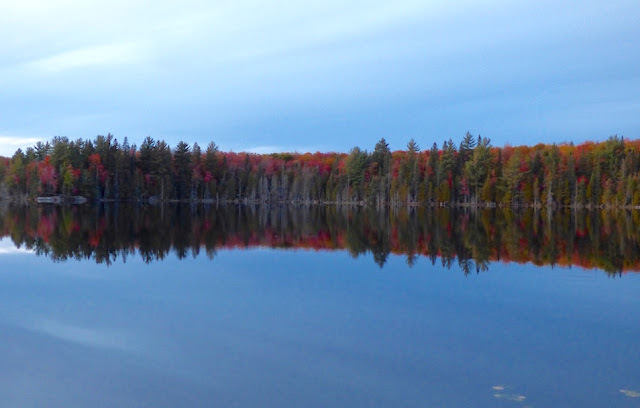 A designated wilderness area approximately 45 miles west of Marquette, Craig Lake has no park headquarters or DNR facility of its own. Registration and information must be obtained at Van Riper State Park, about 8 miles east of the entrance to Craig Lake. Craig Lake is reached via a one-lane logging road, which, until fairly recently, was often impassible without 4-wheel drive and high ground clearance. High clearance is still advised, but recent improvements to the road have made the park more accessible to visitors with standard vehicles. The road can still be a bit hazardous, with large rocks lurking over hills and around bends, and drivers should stay alert and drive slowly to avoid surprises and undercarriage damage. It’s a good idea to call Van Riper State Park to check the road conditions ahead of time. 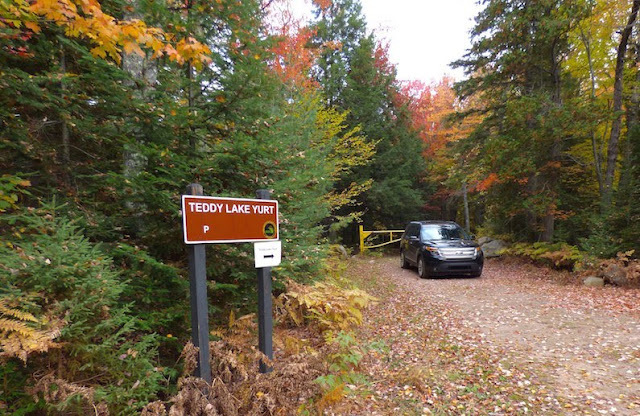 This is the only road through the park, and it creeps through the forest for 7 miles to reach the Craig Lake Trailhead—the starting point of the park’s trail system—and another mile to reach Teddy Lake. As soon as one turns off US 41 and onto the dirt road, a large, no-nonsense sign warns visitors of the rustic and remote nature of the park, and its lack of cell phone service, flush toilets, or modern “camping” hook-ups, and offers unprepared visitors an out by advising that it’s ok to turn around now and try again another time. No hard feelings. Once at the trailhead it’s foot traffic or paddling only. 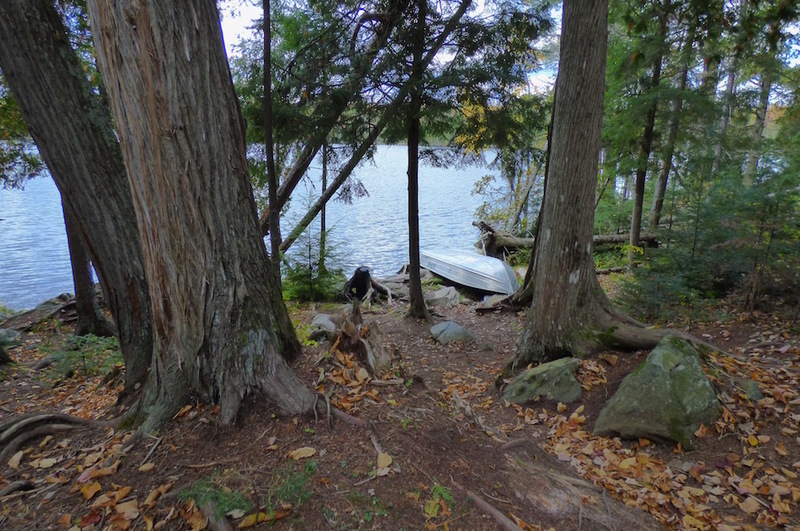 A network of trails loops around Craig Lake and forms various canoe portages connecting it to Clair Lake and Crooked Lake. 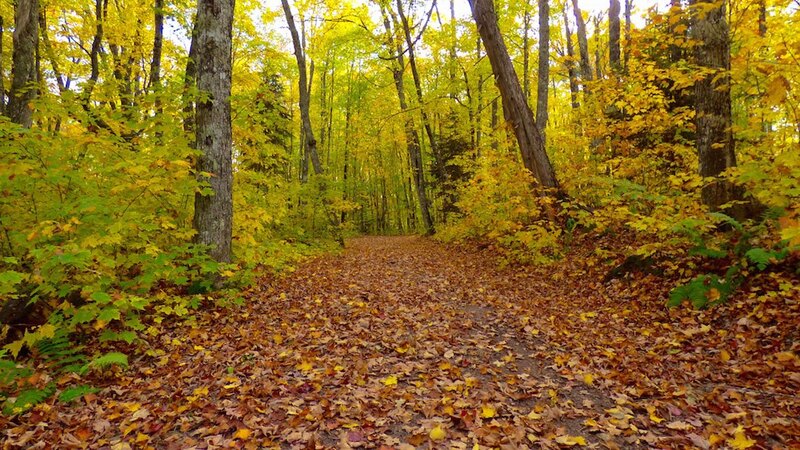 The North Country Trail also winds through the park on its route through the U.P. There are backcountry campsites throughout the park, as well as two yurts—one on Lake Keewaydin and another on Teddy Lake, and two rustic cabins on Craig Lake. The cabins were built in the early 1950s by Fred Miller of Miller Brewing Company; what is now state park land used to be Miller’s private fishing retreat, and Craig, Clair, and Teddy lakes were named after his children. Not to snub the family business, there is also a High Life Creek, which leads to High Life Lake, outside of the park boundary. 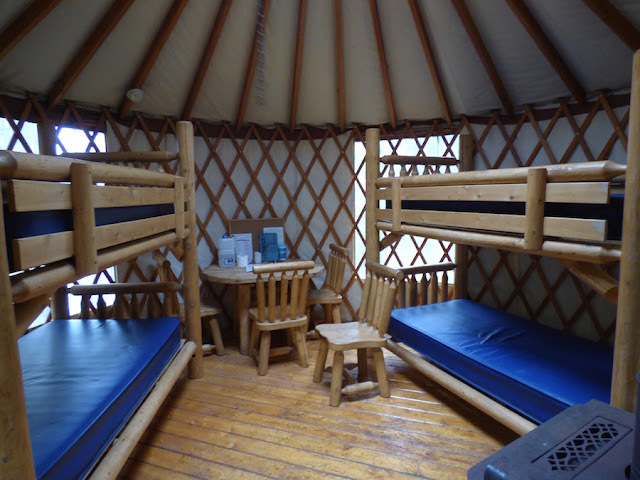 The Miller cabins and the two yurts can be reserved through the Michigan DNR. They do not have electricity or running water, but they do have wood-burning stoves for heat, and the park service keeps them well-stocked with wood. The park’s only water pump is located near the larger of the two Miller cabins. If staying anywhere else, water must be carried in or obtained from a lake or a stream and then purified. Driving the eight miles to the Teddy Lake Yurt took almost an hour, but it was beautiful. 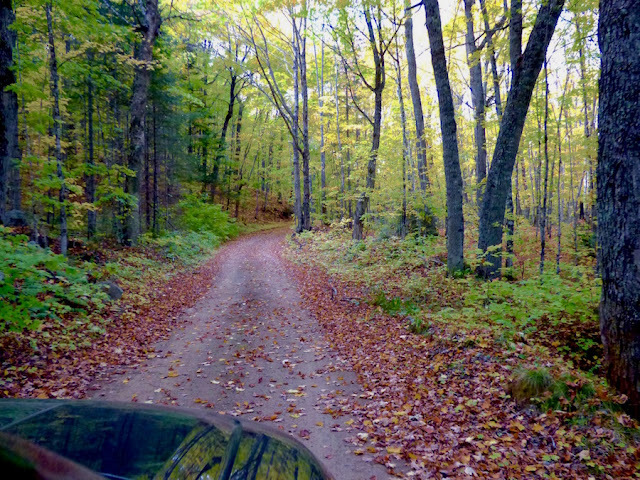 It was the first week of October, and fall colors were peaking in this part of Michigan’s Upper Peninsula. Aside from a few trucks parked at the trailhead, we didn’t see a single other vehicle. Once at Teddy Lake, there is a spot to pull off the road and park, but the yurt is at the end of a footpath, a few minutes’ walk through the woods. We took a few trips back and forth to load our things into the yurt—standard car-camping stuff: sleeping bags, lantern, a month's supply of food for 2 days, etc. The thick blanket of fallen leaves rustled on the path as we walked, and sunlight filtering through the yellow and orange foliage above gave the forest a golden glow. It was a crisp, gorgeous fall day. The path to Teddy Lake Yurt. The outhouse can be seen in the trees. The yurt sits on a hill above Teddy Lake. It is small, with just enough space for the essentials: 2 sets of bunk beds, a small table and chairs, and a wood-burning stove. The space is ideal for 2, or parents with small children. Four adults would be cramped if spending significant time inside, but it’s doable. A cabinet just outside the door contains various cooking supplies, some provided by the park service, others left behind by previous guests, and a long picnic table provides a good space to cook and eat meals. 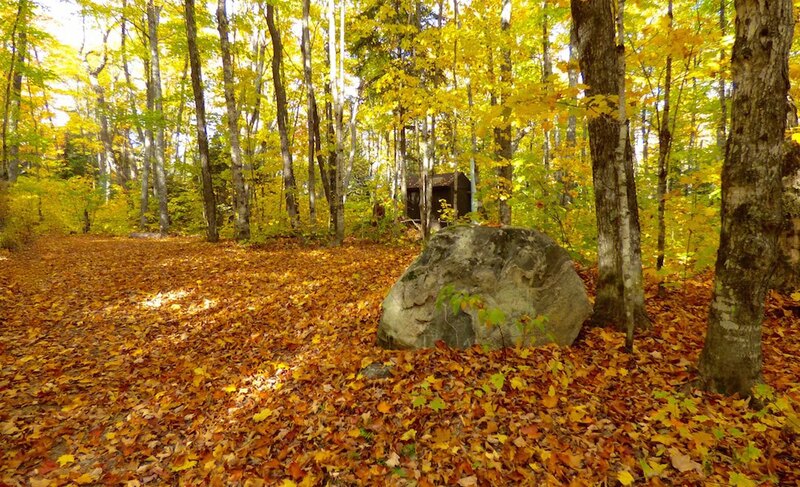 A well-stocked woodshed sits nearby, and there is an outhouse along the path to the road. We each claimed a bunk, then went for a paddle around the lake. Teddy Lake is one of six lakes located within the park’s 8,500 acres. The park provides a rowboat, paddles, and PFDs at the yurt. With the exception of Lake Keewaydin, no motorized boats are allowed on the lakes within the park. According to the park map, a backcountry campsite is located on the opposite side of the lake, but we could see no sign of it. This location is known as a good spot to hear the common loon—my favorite sound on Earth—but we heard absolutely nothing. The lake was utterly still during our visit. I have never experienced such complete silence during other trips to the backcountry. Something somewhere almost always stirs—a raven squawks, a toad croaks, a dragonfly buzzes. Here: nothing. Despite having stayed in rustic state park cabins before, we had forgotten about this issue. We were relieved that we happened to have packed all of our food for this trip in a plastic bin with a lid, and we secured the rest of our supplies as well as we could. If mice want to get in, there isn’t much that can be done. The best we could do was not leave any food lying around to encourage them, and hope they preferred the cold outside to the warm yurt when night fell. With daylight fading and cold creeping in, we started a fire in the wood-burning stove. The yurt warmed up immediately, and the dome window in the center of the ceiling had to be cracked open to regulate the heat. 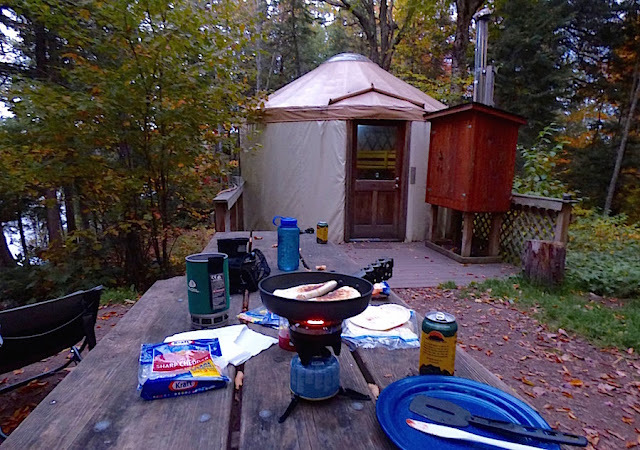 I unloaded some supplies on the picnic table outside, opened a Blackrocks 51K IPA, and made quesadillas on our Jetboil stove. It was a clear night, and the small opening in the tree canopy directly above allowed just a small glimpse of the night sky and its infinite stars. We turned in early, planning to hike Craig Lake Trail the next day. Neat to see this. I have begun planning for a September trip and have an idea to hike to Craig Lake on Nestoria Road. Only 4 miles as opposed to 7, and since I wouldn't want to risk my little Hyundai driving the main access road a hiking route seemed best. 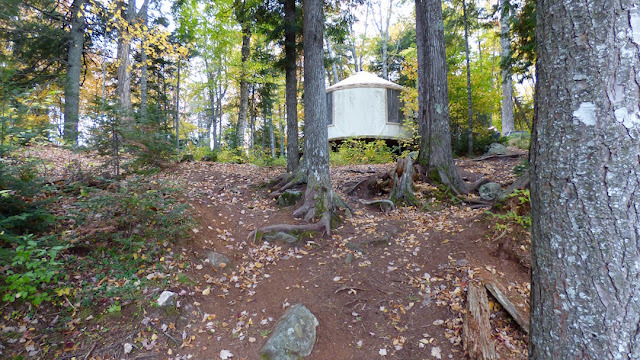 I'd be passing right by that yurt. Sounds like my kind of area. Nice! I only ever made it 1 mile up that road (5 years ago...) and turned around. Looking forward to reading more. Returned from the Teddy Lake Yurt a couple of days ago and just now discovered your well written and accurate description of this place! We were saddened to find that the rowboat was gone - such an important part of this experience. 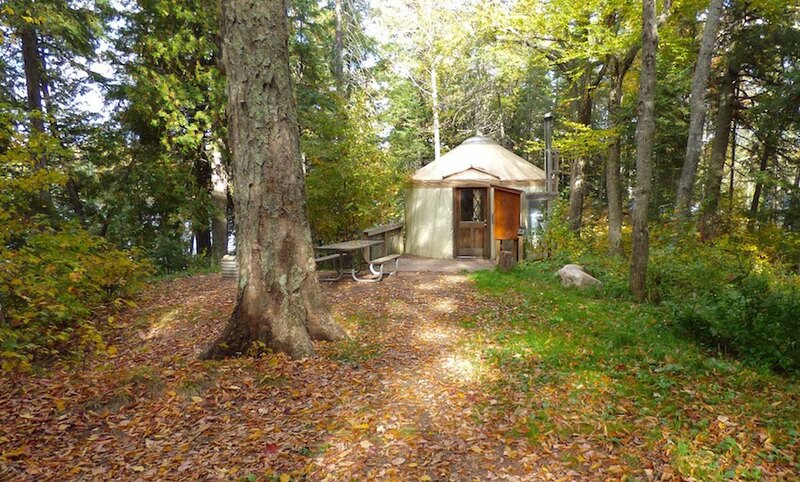 This was our 2nd time to this yurt; the last visit was in June 2012. Fortunately, my son and his girlfriend brought a canoe, so we took turns with our explorations around the lake. The loons put on quite a show! We also saw a couple of yellow bellied sapsuckers, along with evidence of their interesting drilling technique. No mice this time! We were very careful to keep our food locked up in the outside cupboard. Oh, we also saw the northern lights Sunday night around 11pm - a green glow above the north horizon! My camera captured it better than my eyes. Just love this place! In 2007 I shared the caretakers cabin in Craig Lake with my Dad and two of my sisters. We rented canoes from an outfitter in Marquette. And now at 62, I'm making my first trip to Isle Royale! Something I've wanted to do since I first read your blog. I'm blessed that I will be sharing a cottage with my Mom and Dad! Going to do an overnight hike with my sister. It will be my first ever. Thanks for the inspiration! Day 4: MB to W. Chickenbone Lk.